A great excursion for the whole family in Mallorca to Marineland, the water park and zoo in the southwest of the island. You'll be picked up at your hotel or a nearby located meeting point and brought by comfortable bus to Marineland mallorca. The aqua zoo Marineland in Portals Nous is a mix bewteen water park and zoo with a unique sea lion- and dolphin show in Majorca. You'll have enough time to enjoy all highlights of the leisure park, for example the colourful flamigos, the penguins, the tropical house and the turtle station. During your tour to Marineland Mallorca, you can also enjoy the possibility to relax at the in-house beach and sunbathe. At the pool and in the big playground area for children, the younger ones can frolick around and spend a marvellous day surrounded by exotic animals. The Marineland tour is an ideal excursion for children in Mallorca - but also for adults, the leisure park offers a big variety of sights. Also snack bars and a restaurant with sea views are available on site for allaying your hunger. Afterwards, the air-conditioned bus takes you back to your hotel. The easiest possibility to cheaply and comfortably reach Marineland Portals Nous for a day trip from the north, east and south of the island, is the handy Marineland tour in Mallorca. Get picked-up conveniently by an air-conditioned bus at your hotel and brought for a day trip to Marineland Portals Nous in the southwest of the island. Here you can spend an amusing day with your family: Watch the only dolphin show in Majorca or get delighted by the sea lions- and parrot show and the other exotic animals of the leisure park. The Marineland Mallorca is a mix of zoo and water park with a lots of different animals. Get enchanted by the colourful birds, watch the stunning flamingos and the cute penguins, visit the turtles or the aquariums with sharks and many other sea creatures. Of course there is lots of space especially for the intelligent dolphins in Marineland Mallorca, with whose you can also take a picture or swim. 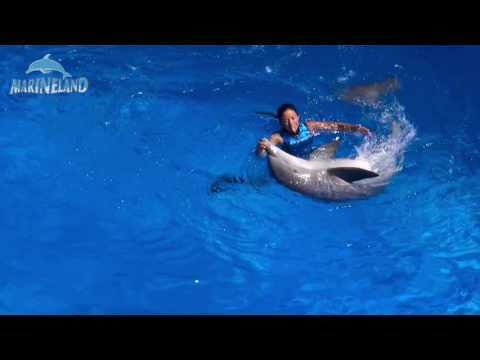 At the tour to Marineland Mallorca you'll quickly realize that the water paradise also devoted itself to the education about their exotic animals. Get to know interesting facts about the dolphins, sea lions, parrots and the further inhabitants of the aqua zoo during your visit. In the tropical house of Marineland, frogs, snakes, iguanas and primates await you. The day trip to Marineland Mallorca is the perfect excursion for families in Mallorca, because even for the smallest ones, they have a separate pool for children. Feast at the snack bar or in the restaurant with sea views and end your excursion to Marineland Mallorca with a visit at their on-site beach, where you can swim in the turquoise-blue water of the big Bay of Palma. Look forward to a terrific day in Marineland Portals Nous, that ends with the comfortable transfer back to your hotel. Was a really great day. The animals look very well kept from the enclosures are clean and gennerell act the animals very happy. In return, the purse begins to cry. Food and drinks are overpriced and bad of maximum chip stands quality. Dear at the exit to the right of the three bistros search. There&#39;s good food at fair prices through to serano plate under 7 euros. All in all, a mega experience. take pictures with the dolphins or seals will cost 12-20 euros. Ps. Thanks to sunbonoo.com. Everything worked fine. War ein super schöner Tag. Die Tiere sehen sehr gepflegt aus die Gehege sind sauber und gennerell wirken die Tiere sehr glücklich. Im gegenzug fängt das Portmonee an zu weinen. Essen und Getränke sind böse überteuert und von maximaler Pommes Buden Qualität. Lieber am Ausgang rechts eines der drei Bistros auf suchen. Da gibt es zu fairen Preisen gutes Essen bis hin zur serano Platte unter 7 Euro. Alles in allem aber ein mega Erlebnis. Fotos machen mit Delfinen oder Seehunden kostet zwischen 12 und 20 Euro. Ps. 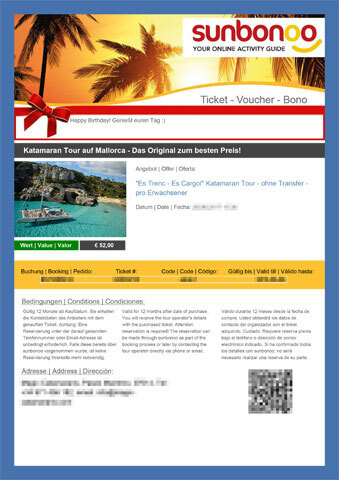 Danke an sunbonoo.com. Hat alles prima geklappt. the show was great, but if the animals that like to do, because I have my doubts. I will not go and the dolphins love the open sea view. die Show war toll, aber ob die Tiere das gerne machen, da hab ich meine Zweifel. Ich werde nicht mehr hingehen und die Delfine lieben im offenen Meer sehen. We had a very nice day in marineland and especially my nephew really enjoyed it. A highlight was definitely the dolphin show :) The organization of the transfer has worked without any problems. Die Organisation des transfer hat auch ohne Probleme geklappt. Goods with the whole family at Marineland and the pick up and drop have worked smoothly. Marineland which is worth visiting, especially if you absolutely want to see dolphins in Mallorca. The children had a lot of fun, there are really large play areas and a small pool to splash around. Not quite cheap but we four had a nice day, we would do it again. Waren mit der ganzen Familie im Marineland und die Abholung und Rückfahrt haben reibungslos geklappt. Das Marineland selbst ist sehenswert, vor allem wenn man unbedingt Delfine in Mallorca sehen möchte. Die Kinder hatten sehr viel Spaß, es gibt wirklich große Spielzonen und einen kleinen Pool zum Plantschen. Nicht ganz günstig, aber wir vier hatten einen schönen Tag, würden wir noch mal machen. You're reviewing: Day trip to Marineland Mallorca: tour to the water zoo with dolphin show. How do you rate this product?